Snooper DVR-1 is a vehicle drive recorder which is small enough to be located behind the rear view mirror and it will record incidents in the road ahead using its 120 degree angle lens. Video is recorded in MPEG-4 using a 0.3 high quality sensor. The DVR-1 will also record sound, the date, time and your vehicles speed. Not only can you record incidents on the move there is also an anti-vandal parking mode so you can record whilst the vehicle is parked. The DVR-1 also comes with a 4GB micro SD card. There is also a 3 axis G-sensor which will monitor impact from 3 separate directions. Furthermore, you can watch the video back on a computer monitor with the included software or on a TV. On a computer you can track your position on Google Maps and it shows the date, time and your vehicles' speed. The replacement dash cam from Snooper is the DVR-1HD Mini. 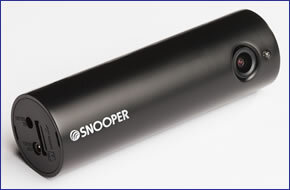 Snooper DVR-1 is a simple, small, discrete video recording device which is designed to monitor and record your journeys. This video can then be used as evidence of events along your journey such as incidents for insurance purposes. The DVR-1 will work in both light and dark conditions and you will get clear pictures. You can watch the video back on a computer monitor or TV. The DVR-1 records using a 120 degree lens providing a wide viewable/recordable area enabling you to capture the maximum amount of information about the road ahead. Video is recorded to the device using a 0.3 mega pixel sensor and video recorded is recorded in MPEG4 format. The DVR-1 will record audio using the microphone (which can be muted) and it also records the date, time and your vehicles' speed during the video. The Snooper DVR-1 can be installed behind the rear view mirror and has a quick release windscreen bracket. There is a built-in micro GPS and miniature video camera that help to make this system very discrete and simple to install. Automatically and continuously record even when you are parked. Anti-vandal parking mode enables you to record and playback any incidents whilst your vehicle is parked. The DVR-1 comes with a 4 GB SD card included. As a guide an 8GB SD card provides estimated recording time of between 8.5 hours and 10 hours. There is an EU version available which simply has a larger 8GB SD card included with it. Both of the the DVR-1's can support microSD cards up to 32GB. There is a 3 axis G-sensor which will monitor impact from 3 separate directions. There is also a software package that comes with the DVR-1 that allows you to view your position on Google maps as well as hear the recorded audio and it displays the date, time and your vehicles' speed. Do you have a question about the DVR-1 that's not been answered on this webpage? Please see our Dash Cam FAQ's for questions from other people. If the answer to your question isn't featured, use the online form to ask us for the answer. Alternatively please telephone 01733 777623 Monday to Friday (9:30am-5:00pm) to speak to one of our sales team. For further information online please see the Snooper dash cam comparison table.